Enjoy greater security and peace of mind with PayPal’s free Payment Review feature, designed to reduce losses due to unauthorised transactions. A new payment status alerting sellers to potential, high-risk transactions before they ship their items. How does Payment Review work? Following the few easy steps below could save you money. Important: Before you ship, always check the payment status by referring to the 'Transaction Details’ found in your payment notifications emails or the ‘Details’ link of your account ‘Overview’ or ‘History’ page. Note: Funds relating to a payment under review by PayPal will be temporarily held and will be reflected in the ‘Pending Balance’ until review is completed. If the payment status indicates ‘Ok to ship’ – Payment Status: Completed, you may proceed to ship your item. To know if your item is covered, check the ‘Seller Protection’ section of the ‘Transactions Details’ page and ensure that it states ‘Eligible’. 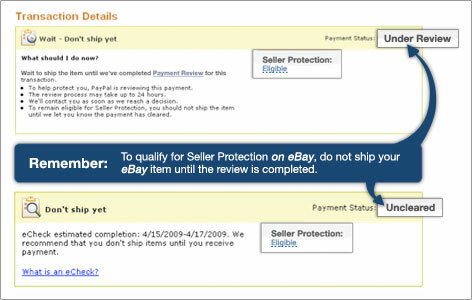 Important: Only payments for eligible eBay items may be covered under Seller Protection. Payments for items sold outside eBay are not covered. If the payment status indicates ‘Wait…Don’t ship yet – Payment Status: Under Review’, you should wait to ship your item until one of our anti-fraud specialists has reviewed the payment to determine if it is fraudulent. For most transactions, this takes only 24 hours. Please note that for payments made via eCheck, 3-4 days is required for review and clearance. After the stated review period, please check your 'Transaction Details' again. If the payment status now indicates ‘Ok to ship – Payment Status Completed’, you may proceed to ship your item. However, if the transaction is believed to be a fraudulent or an unauthorised payment, the payment status will show ‘Stop - Don’t Ship Payment Status Cancelled’. In such cases, the payment will be cancelled and PayPal will reverse the funds from the 'Pending' balance of your account. Because the item remains in your possession, you won't incur any loss.